Arrive in style, feeling refreshed, ready to enjoy your event or go straight into your meeting having used a private helicopter hire to avoid the stress of traffic jams and delays. Maximise your time by using private helicopter hire, which gives you VIP service, better security and a flexible timetable built around your own bespoke itinerary and travelling requirements. Benefit from the greater flexibility which travelling by private helicopter hire gives you. Escape from the constraints of timetables and worrying about the logistics of travelling; allowing for delays and congestion you may not encounter, which wastes your time or conversely stressing about delays and congestion, which you have not allowed enough time for and is making you late. 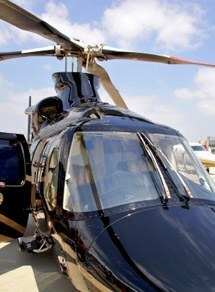 Using private helicopter hire you will arrive where you want to be, when you want to be there, without these concerns. Experience a luxurious and comfortable trip as well as point to point travel. With private helicopter hire you will be picked up near your home or office which saves you time and will give you greater convenience and flexibility. Take advantage of short breaks as well as more efficient business travelling by using private helicopter hire to get you to your destination and significantly reduce your travelling times. You will be able to attend special events or extra meetings which were not possible with conventional travelling times. With private helicopter hire you travel in a fast, efficient and flexible way, which means even the busiest of people will be able to attend those important events or spend time with their loved ones. Simply pick up the phone and leave the travel details and arrangements to us, safe in the knowledge that we will do the rest. You will benefit from a reliable service that gives you maximum enjoyment from your trip, without worrying about trivial things or suffering from delays, which takes the shine off otherwise memorable experiences or successful business trips. This is a bespoke, personal and discreet service, designed to make your journey more than just a means of travelling. Using private helicopter hire is a lifestyle option for the discerning passenger who values their time. For more details or to book your private hire helicopter and experience VIP Service please call our team now on 01256 635000 to reserve the date.